I belong to this big number of family. I am the youngest among nine siblings.Since I am the youngest I am used of how my sisters and brothers discipline me. My family contains noisy people but happy together. 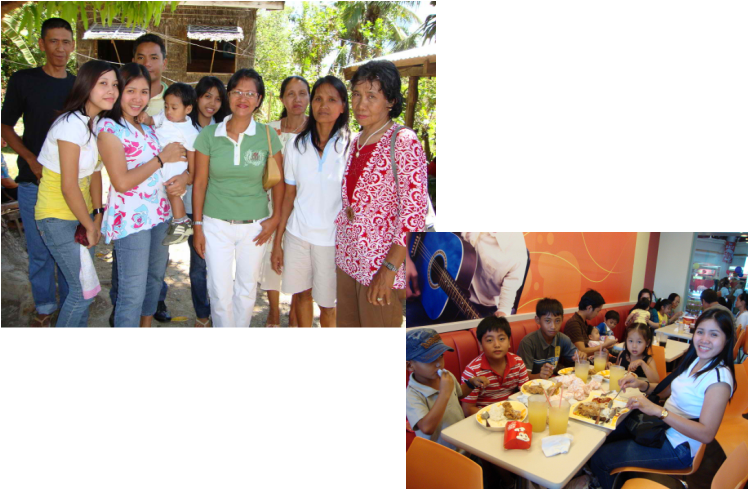 From left(upper left picture) we have ate mhyles,ate rhaine,my nephew KR,cousin ate lerma,cousin estring ,lola clarita and at the back,the girl there is me and the two are my uncle and"bayaw." The other picture we have kyle,joshua,clifford and the unica ijah lyka. Now,most of them get married already. I'm glad that they are my family because even they've got their own life they still help me in taking up my college.And taking care of my mom.That's what family for right?